Portrait, head and shoulders, turned a little to left and looking to front; the sitter is wearing a necklace of pearls and a low-cut dress. Features delicately stippled and hatched in brown and sanguine with some blue and grey and some white heightening (but see Condition), on a pale carnation ground; hair in a very transparent pale brown wash, hatched over with darker colour and touches of blue-grey; dress in black wash, the lights in pale grey; the jewel picked out in brown and grey with highlights in gold; the pearl in brown wash with a grey and white highlight; background in a solid blue wash, shaded darker to the left and low down; traces of a gold marginal strip; on vellum put down on a leaf from a table-book. Frame: The miniature is directly attached to its old, nearly flat bevelled glass and fitted as the centrepiece of the first of two vitrines containing the so-called Leicester House miniatures. The vitrines appear to be constructed in two parts, of possibly different dates. The inner and apparently earlier is a short plank of fruitwood, ebonised on the front, into which oval and circular complex bolection mouldings, cut from a fine-grained ebonised fruitwood, are set, thus providing a rebate for the miniatures. The outer part is a deep picture frame of fruitwood stained dark brown, with a glazed rebate into which the inner part fits. Miniatures in both sets are labelled with apparently late eighteenth- or early nineteenth-century inscriptions on the inner part and carry number labels from South Kensington 1865.The backs of the outer part have been built out with hinged shutters and fitted with brass furniture of the late nineteenth or twentieth century. This work was probably ordered by Lewis, lst Viscount Harcourt (see below), who is recorded on two of the individual object labels (Due d'Alencon and Lord Burghley) as having added them to the set in 1907 and 1911 respectively. 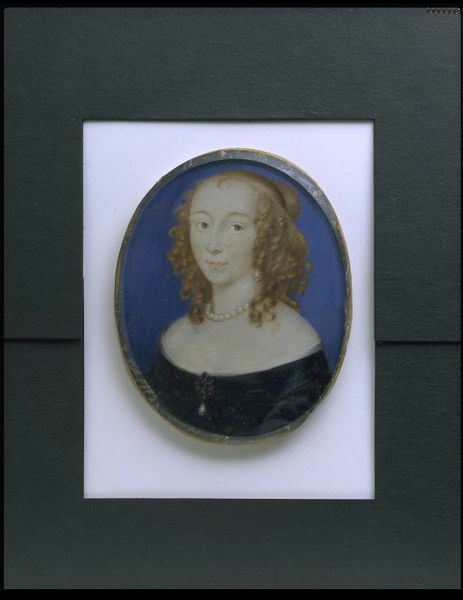 The vitrines, and miniatures from both sets, have been conserved; in some instances, such as the Mary Sidney, I they have been heavily restored. This may have been under the aegis of Joseph Duveen, from whom there was a note, which was still preserved in one of the vitrines when they were inspected by the present cataloguer in 1980. Lewis Harcourt's active curatorship of the sets would relate to the fact that he was a trustee of the British Museum, the NPG and the Wallace Collection and was a founder and trustee also of the Museum of London. This miniature is one of tem by various artists acquired as a group and displayed in two frames. Nine of these miniatures are in the V&A collection, E.1170-1178-1988. 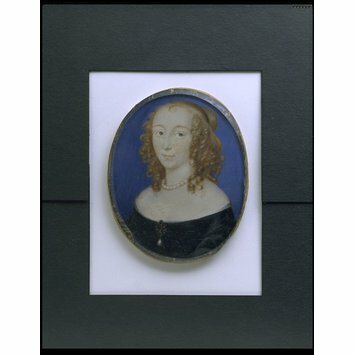 The tenth miniature by Nicholas Hilliard of the poet Mary Herbert, Countess of Pembroke is now held by the National Portrait Gallery, London. 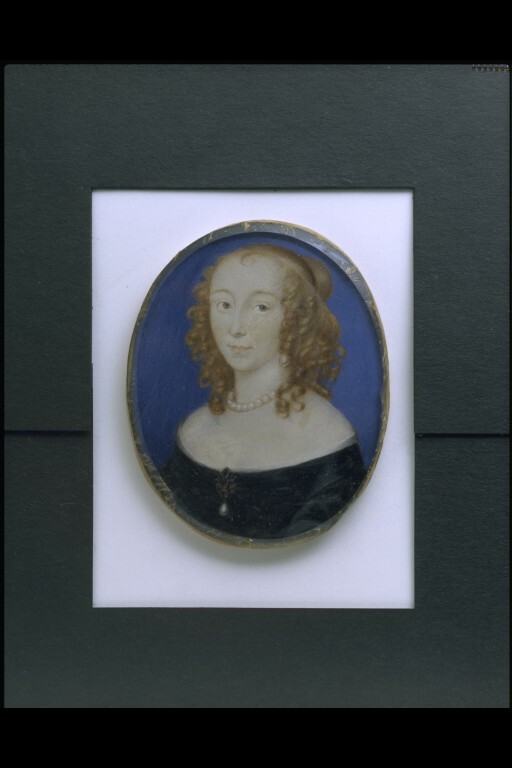 Portrait miniature of Lady Dorothy Percy, subsequently Countess of Leicester, watercolour on vellum, painted by John Hoskins, ca. 1638. Strong, Roy, "The Leicester House Miniatures: Robert Sidney, 1st Earl of Leicester and his circle", Burlington Magazine CXXVII, October 1988, p. 697. Murdoch, John. Seventeenth-century English Miniatures in the collection of the Victoria and Albert Museum. London: The Stationery Office, 1997.